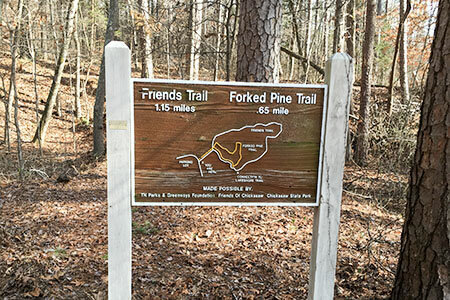 Chickasaw State Park is a small park within a much larger State Forest. All of the trails were clear of down fall and in good shape when we hiked them. The trails were also litter free. I did pick up a couple of water bottles along the shore of the lake, but they probably were not left by hikers. The trails were easy to follow. On the Lake Shore Trail, near the Beach Area, it was difficult to find an exact track in the grass lawn, but it really didn't matter where you walked - the key was to just continue along the shore. The Visitor Center has restrooms, water, and information - available year round. I did not meet anyone on the trails, but I did see one vehicle parked at a trailhead. The trails have many boardwalks, raised walkways, and bridges, many have recently been rebuilt (JAN2016). Hopefully, the bridge spanning the lake will be re-built soon! 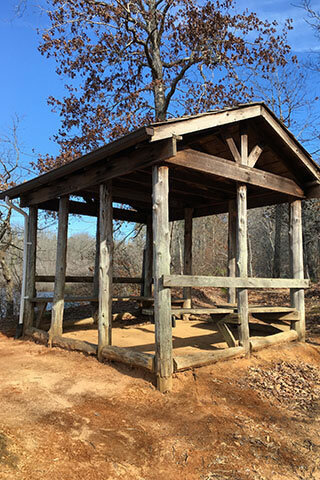 The Park also offers Cabins, camping, picnicking, and a restaurant.